MEMBER'S EDITION BONUS CONTENT: This week, the latest installment of "Important, Fundamental Matters" from Kazunari Furuyama and Yilun Yang's hard endgame problem. As a special bonus we've also included the game record from Iyama Yuta's 1st-round win over Cho U in the Meijin. Enjoy! Non-members: join the American Go Association and get all this great content with every EJ! It's all just a click away! 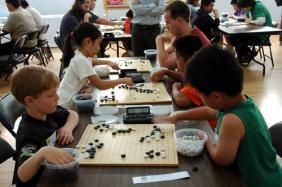 NORCAL AUGUST RATINGS TOURNEY SETS ATTENDANCE RECORD: Forty-eight kids and adults played go over Labor Day Weekend at the Bay Area Go Players Association August monthly ratings tournament in Palo Alto, CA, setting a new attendance record for the monthly ratings tournaments. Players from 7 dan to 30 kyu participated, and people came from as far away as Los Angeles to play. For nine of the players, this was their first rated tournament, and the AGA got seven new members before the day was over. Wenyi Feng 3d won the dan division and Robert Bates 9k won the kyu division, each winning all four of their games. Click here for details for the September monthly ratings tournament. COTSEN OFFERS $5K PRIZE PURSE: Pre-registration is now open for the 2008 Cotsen Open, one of the largest tournaments of the year, set for September 20-21 in Los Angeles, CA. With over $5,000 in prizes, the Cotsen also features one of the richest prize purses of the year. Because of the event's growth, this year's Cotsen will be held in a new venue, the UCLA Bradley International Hall, the same location as the N.A. Oza West earlier this year. The Cotsen is also famous for its free luxury buffet (only for those who pre-register), masseuses ("to ease the tensions that arise in your shoulders when you discover that your big group really doesn't have two eyes) and registration refund (for players who play all five rounds). To register via e-mail, fill in the online form and send to casie@thelec.com before September 12. Top boards at the Cotsen will be broadcast live on KGS by the E-Journal, which will publish updates on the tournament on the AGA's website. KGS HOSTS U.S.-CHINA FRIENDLY TEAM TOURNEY: Six strong American players will face six top amateur players from Jiangsu province of China in the "361 Club" room of KGS at 9A EDT and 10P EDT, this Sunday, September 14, reports Lie Li 9D. The US team includes Huiren Yang 1P, Joey Hung 8D, Dae Hyuk Ko 8D, Eric Lui 8D, Thomas Hsiang 8D and Jie Liang 8D. The players from Jiangsu are Chinese amateur 6 dans, and include Zhang Lei, Chai Qingying, Liang Cheng, Wen Jie, Wang Shao and Wang Xinjia. All have been Jiangsu Youth Champions; Chai ranked 4th in the Chinese national amateur tournament (Wanbao Cup), Wen was the 3rd World Student Champion and Wang Shao was the amateur champion of Japan. Ke Lu 5D is the Tournament Director and Jie Li 9D and Eric Lee 3D are Assistant Tournament Directors. "Calvin Sun 6D will also play with Chen Fan 5D, a 12 year-old girl from the Jiangsu province," Li adds. WORLD STUDENT OZA REGISTRATION OPEN: The deadline to register for the North American qualifying tournament for the World Student Oza is October 19. "General criteria are residency -- not necessarily citizenship --in North America, under the age of 30, and enrollment in a full-time university program, as well as a minimum AGA rating of 5.0 or its foreign equivalent," reports AGA Tournament Coordinator Phil Waldron. Click here for details on this year's tournament. LUI AND HSIANG TAPPED FOR INT'L TOURNEYS: Eric Lui (left) 8D and Thomas Hsiang (below right) 8D have been tapped to represent the United States at the World Amateur Go Championships (WAGC) and Korean Prime Minister's Cup, respectively. The Prime Minister's Cup will be held next month in Seoul, Korea, and the WAGC will be held next May in Japan. "Eric is one of the nation's top amateurs and has qualified through the AGA's selection process," reports AGA Tournament Coordinator Phil Waldron, "notably placing as the top citizen in US Open championships for the past two years." Waldron's recommendations have been submitted to AGA President Allan Abramson for final approval. Waldron also reports that "the web page related to the AGA's various invitational tournaments is being updated." The Invitational Tournament page includes the current WAGC point standings and new pages for both the Korean Prime Minister's Cup and the Student Oza. Click here for more information about the WAGC, the AGA's WAGC selection process and the historical performance of American representatives. NOVEL GO: David Boop's new book "She Murdered Me with Science" has a scene where the main character is playing go in a go parlor, reports Karen Jordan. "David is a go player," Jordan - who met Boop while working at the recent World Science Fiction Convention in Denver -- tells the EJ. "He included a brief description of go (in the novel). I had hoped that after the main character said that he wanted to die in a corner that he would die in a corner in his go game, but apparently that didn't happen. Anyway, I'm glad to see that David was able to include go in a ‘mainstream' novel." TEEN IYAMA TAKES FIRST GAME IN MEIJIN: Teenager Iyama Yuta (right) 8P defeated reigning Meijin Cho U 9P by 5.5 points in the first game of their best-of-seven-game match on September 4-5. An SGF file of the game is attached; the opening play is quite spirited. Iyama has been amassing an amazing record the last few years, but a top-seven title in Japan has never been won by a teenager, and winning this title would bring him to a whole new level. The second game is scheduled for September 17-18. Iyama is also maintaining his lead in the current league to determine the challenger for the Kisei. There are two six-person round robin leagues, and the two winners play each other to be the challenger. About halfway through, Iyama is 3-0. Everyone else in both groups has lost at least one game. Iyama will be playing Cho Chikun 9P on September 11th. ALL-CHINESE FINALS IN WORLD OZA: The finals of the 4th international Toyota Denso World Oza Cup will be between two Chinese representatives this time, Piao Wenyao (right) 5P (who defeated his fellow countryman Xie He 7P in the semifinals), and Gu Li (left) 9P (who knocked out Cho U 9P of Japan). The best-of-three-game match will take place in early January in Tokyo. The first three editions of this event were won by Koreans: Lee Changho 9P won the first and Lee Sedol 9P won the next two. Cho U did make it into the finals last year. This is yet another indication of the success the Chinese are having in challenging the recent dominance of the Koreans in international events. Piao is just twenty; he won the CCTV Cup in China last year. Gu Li 9P has been one of the very top players in China for several years now and has won many titles, including the international Fujitsu Cup in July of this year. KATO BECOMES STRONGEST WOMAN: Kato Keiko (right) 6P defeated amazing teen Xie Yimin 3P 2-0 to take the 10th Japanese Strongest Woman (Seikyo) title. She won the Women's Meijin in 2007, but lost it this year to Xie, who holds both the Women's Honinbo and the Meijin. Xie held the Strongest Woman title in 2006; it was her first title win. Cho Chikun (right) -- famous for his fightbacks in Top Three titles -- has managed to fight back from an 0-3 deficit on three different occasions - and 9 of 18 of you selected three as your correct answer - but the correct quiz answer was actually four. Jonathan Huber provides the correct and sad complete details: "That was clever to ask ‘involved in' (as) Cho Chikun has won a miraculous fightback 3 times (7th Kisei, (9th Meijin, 47th Honinbo), but the tables turned on him When he lost the 38th Honinbo" to Rin Kaiho in one of Rin's two miraculous fightbacks. Seven of you chose the correct answer, including this week's winner, Oliver Nava, chosen at random from those answering correctly. In an interesting sidelight, EJ reader Young Kwon commented with pride "I had the honor to teach him (Cho) at 6 stone handicap when he was 5 years old" Wow! THIS WEEK'S QUIZ: RATINGS POLL: While I firmly believe the AGA has one of -- if not the -- best rating systems in the world, there is substantial evidence that it's softer then the European system, and similar evidence that our ranks are stronger than the Japanese. How do you feel about this situation? Click here to let us know whether the AGA's rating system match those of other countries, and if so, if our ranks should match the Japanese or the Europeans. Also, how much weaker do you think AGA ranks are, compared to the Europeans, and how much stronger than the Japanese? Note: we welcome responses from readers around the world as well as here in the United States! AMERICAN PAIR GO, NOT NORTH AMERICAN: "Edward Zhang's report in the 9/1/2008 Journal refers to the championships held at the American Go Congress this year as being the North American Championships," writes Jean Waldron. "I'd like to point out that while it was an excellent tournament, it was rather, the American Pair Go Championships. The Canadian Pair Go championships were held in Quebec City on September 1." The error was made in the editing process and was not Zhang's; we regret the error. LASKER NO SLOUCH: "The Grandmaster title as we know it today was instituted in 1950, well after Lasker's prime ("Edward Lasker Good But Not Grand" 9/1 EJ)," writes Peter St. John. "The term was used variously prior to that; there was no official list. Lasker was second in the United States after the legendary Frank Marshall and with Marshall was one of only two US participants in the great tournament New York 1924. What must be understood is that the International Master title awarded to him by FIDE was decades past his competitive peak. So by the standards of the 20's, it would be reasonable to call him a grandmaster. The main take-away is that the title had not been invented yet in the modern sense; and that he was number 2 in the country. No slouch. Not a dilettante." Click here for a brief history of the title.